As of January 2006 I am now dividing my Portfolio page into two sections, one (this one) with works spanning the years 1989 to 2001. The other newer page will have notable works made after 2002. Click the above link to go to more recent works than what you see below. The following images are all of work spanning the 10 years between 1989 and 1999.. Please browse intensively...you will likely find something that appeals...when you do, don't hesitate to contact me and let me know your thoughts about what you like, what you would like, or for that matter what you don't like. 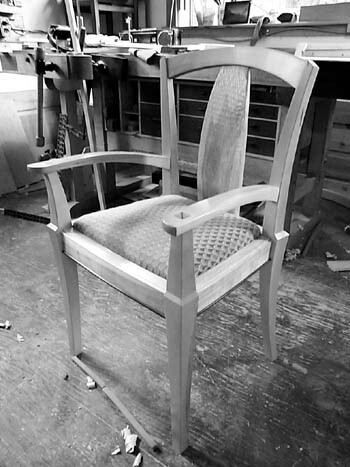 Dining suite: 1997/98; Eastern Maple, pearwood, Bird's eye maple. Table, six side chairs, two arm chairs, and china cabinet. 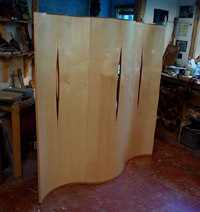 This one was made for the touring show, " Canadian Furniture Exhibition"
Various Screens: 1996, 1999, 2002; various woods. 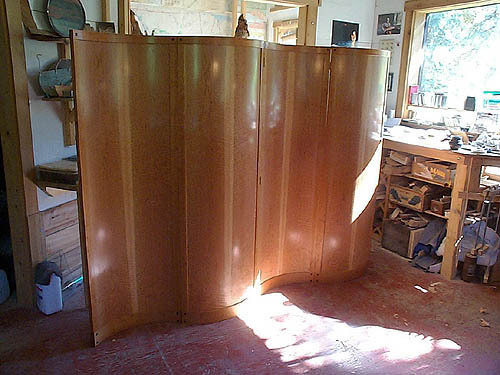 For a detailed look at the construction of the Curved screen shown above go to: The Curved Screen , otherwise click on the thumbnail for a larger image. This was the first project made in my Kispiox workshop. Constructivist Credenza: 1994; Claro walnut, ebony stringing. This piece was designed in conjunction with Robert Miranda, who handed me a concept and then we both set about to expand the idea. It was a true collaboration with each of us contributing to the growth of the piece. Credenza (demi-lune): 1990/91, figured claro walnut, doussie, macassar ebony, eastern maple, wenge. Lingere case: 1989, Pearwood and bird's-eye maple.